I hadn’t heard about nail wraps until my sister told me about Jamberry. Jamberry is a company that started in 2010 by three sisters who wanted to find a more cost effective way to get a manicure after having wraps professionally applied to them in a salon. We all know that going out for a great manicure can cost a pretty penny. Jamberry allows you to have great looking nails at half the cost and they are pretty durable too. For individuals that do not want to part with polish, they also have a line of salon-professional nail lacquer in a variety of colors. However, since Jamberry specializes in nail wraps, I will review them here. If you guys have been following me on YouTube, then you might have already seen my unboxing video of a Jamberry order. Each sheet of wraps come with 2 rows of 9 strips for a total of 18 strips. Each row if meant to last for 1 manicure and 1 pedicure, so having 2 rows means that it’s supposed to last for 2 manicures and 2 pedicures. However, if you are like me and would just like to use these wraps as accent nails, then these can practically last for months, or even one year if you don’t use them regularly. 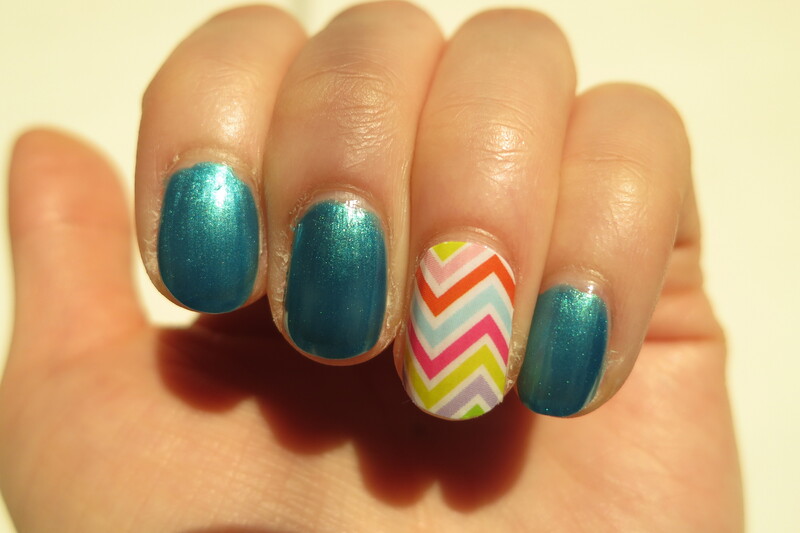 Here are pictures of one of the designs on my nails. Application. As you can see, they look much better than a “nail sticker” that you just peel and stick. They are heat-activated so you can use a hair dryer or a space heater to heat it up. I used a heater because my sister got one as a prize from the online party she was invited to. A hair dryer works just as well. When the strip is pliable, you position it carefully to make sure it does not touch the cuticle or the skin around your nail. 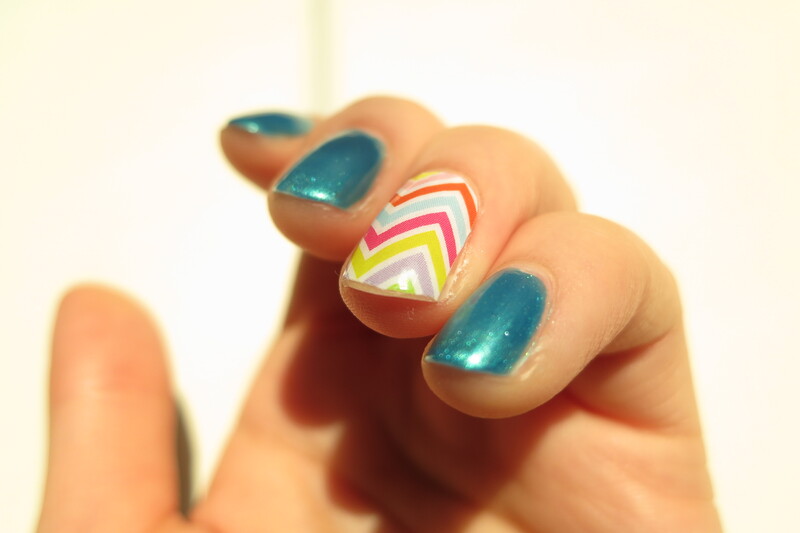 It’s better to select a smaller strip than the size of your actual nail to properly position it. Then you press it down and then file the excess wrap off with a nail file. Since they are vinyl, there is no dry time. As long as you don’t go soaking your hands immediately in a sauna-temperature bathtub, you’re good to go. I recommend putting it on before you go to bed to help the adhesive perform properly on your nail. Wear. These wraps last long if applied well. If they do not lay flat on your nail and you’re not able to smooth it out with some stretching and pulling, moisture can interfere with the wrap’s ability to adhere and it might come off in a few days. The claim is 2 weeks, and the longest I’ve had a wrap was 8 days. I took it off because I wanted to try a new design so it wasn’t necessarily because it was peeling off. It actually looked pretty good :). I work in a profession where I frequently use hand sanitizer and wash my hands, and to have these wraps survive them is pretty impressive. On the other hand, my polish chipped right away. 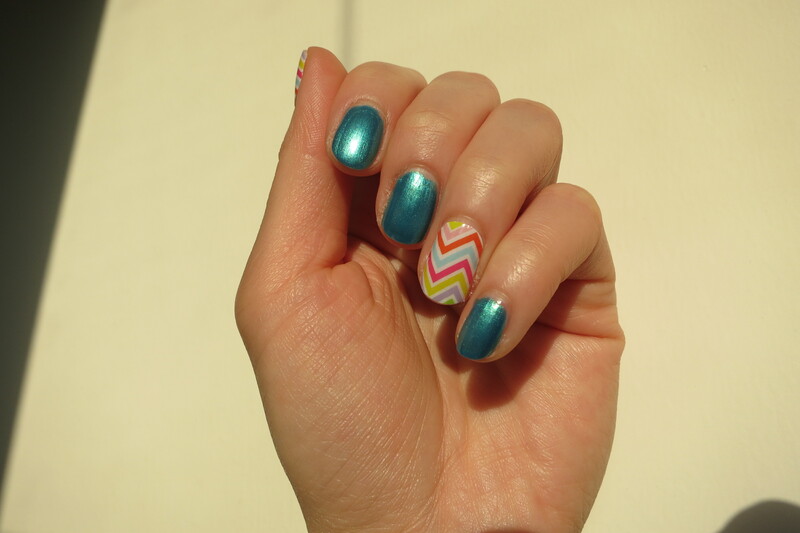 The one used in the picture is Sinful Colors in the shade of aqua. Removal. Removal is painless if you are patient. If you are not and are like me, you will go ahead and peel the thing off. This is a BAD IDEA. Just like with nail polish, if you pick at it, it will not go well. My nails peeled. Then I realized you have to FOLLOW INSTRUCTIONS and use either acetone or baby/coconut/olive oil to gently wear down the adhesive. If you do it carefully, you will come out unscathed. Don’t say I didn’t warn you! Score. I give it a 8/10 for ease of application. If you watch the video and prepare accordingly, you will be OK. I took off 2 stars because it is not so friendly on curvy nails, and if you don’t pay careful attention, then you can see some bubbles and wrinkles, and it has the potential of popping off within a few days. I think it’s just a matter of experimentation and seeing what works well, so I’m sure that this could be fixed eventually. I give it a 9/10 for wear. Since I didn’t really do a true wear test to 2 weeks like it says, I can’t attest to it lasting that long. But it did last for a long time so that gets high marks. I give it a 10/10 for variety because they have a ton of designs (300, i hear! ), and they come out with new ones (while retiring a bunch) every year. You can also design your own for an added cost, and as long as they aren’t trademarked designs, you are good to go.